The French train service, SNCF (Société Nationale des Chemins de fer) still runs trains that will carry your car from Paris to 18 or 19 stations in the country. 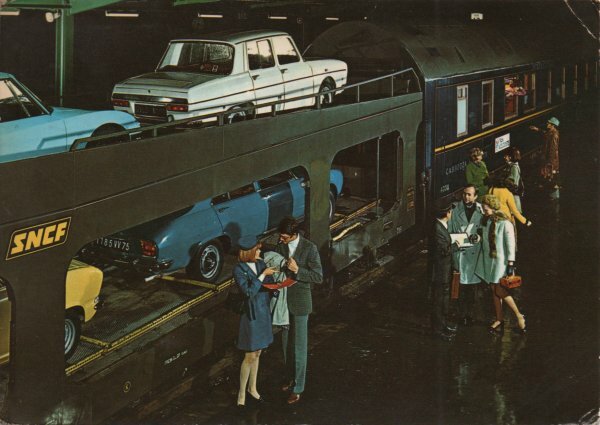 Unlike the one pictured in this 1970 postcard where the cars travelled behind the sleeper trains, nowadays you travel on a sleeper train and your car travels separately. A similar service in the UK, the Motorail, stopped operating during the 1990s. In spite of taking a lot of the traffic off the roads, the French authorities have regularly felt the need to run road safety campaigns on their stamps. I think their messages are all self explanatory. 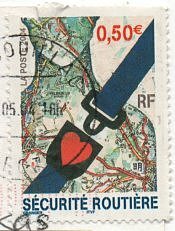 I rather like the design of the last one which I have on a card from 2004, showing a human body overlaid with road maps and wearing a seat belt. Great postcard, it does have a very 1970s feel to it. 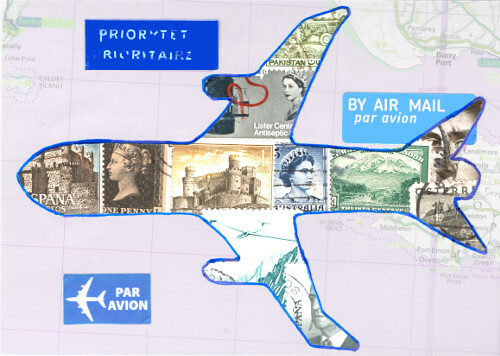 I hadn't seen the stamps before, a lot of details in some of those designs. This would make me a bit nervous about driving in France! I didn't know about the train service - that is a brilliant idea. I'll go with the seat belt stamp as one saved my wife from serious injury some years ago. I don't think we have such a train service in Australia. Great idea though for travelling long distances. 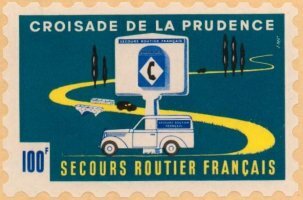 I really like the 70s feel of the postcard, and the design of all the stamps. But I agree with you - the seatbelt stamp is particularly impressive. Wow ... I've never even heard of such a thing. What a great idea. Though it seems that American's would rather drive than ride the train. Amtrack isn't exactly known for being on time around here ... one time our granddaughter's train was 8 hours late, and we spent the night in the middle of winter in a parking lot waiting for her (it was a 45 min. drive back home). 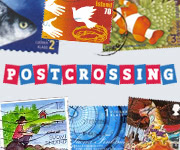 Great stamps, with messages that I guess never get old. The seat belt one is very clever, brings a new meaning to arterial. The postcard is perfect 70s, I've never taken a car on a train but do like French trains. 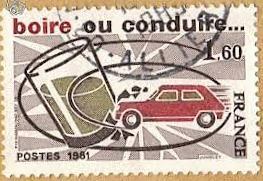 I think every country could do with road safety messages on their stamps! To bad people don't seem to heed them as they should.